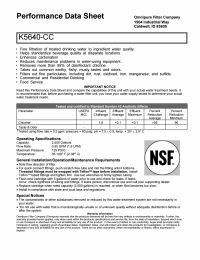 The Omnipure K5640-CC Inline Coconut Shell GAC Filter reduces chlorine, bad taste and odor from your drinking water and is NSF Certified to Standard 42. Helps standardize beverage quality at disparate locations. The K5640-CC is identical to the Omnipure K5633 which now both utilize acid rinsed coconut shell carbon that is compliant with California Prop 65. The K5633 formerly used coal based carbon, but has now been updated. For quick connect fittings, push scratch free tube end into the fitting until it bottoms. Threaded fittings must be wrapped with Teflon tape before installation. Install Teflon taped fittings and tighten firm. Use two wrenches to firmly tighten tubing. Flush new cartridge with 5 gallons of water prior to use and check for leaks. If leaks occur, check tightness of tubing and fittings. If leaks persist, discontinue use and call your supporting dealer. Replace cartridge when rated capacity (2,500 gallons) is reached, or when flow becomes too slow.